Recently I came across a scenario where I need to detect failed slices of all Datasets in Azure Data Factory, in my case I need to detect for last 3 months and the number of slices was around 600+, they failed due to validation error as the source data wasn’t present and after a number of re-try slices were marked as failed. In such cases its difficult to perform re-run from the Portal as you need to right click on each slice and run it explicitly. Solution: I wrote a following PowerShell Script, this script will detect all failed slices in a given Azure Data Factory and re-run same with your consent. You can use same script not only for failed slices but for any status, you just need to change the Dataset status in filtering of slices, shown in following script. I am also planning to write a solution which will run as a service in a worker role and automatically detect failed slices in a given time and re-run same. Question can be asked, that in ADF you already have re-run logic they why you need to go through the hassles of writing and running script. Yes we do have but after x number of re-runs a slices is marked as failed and only way is to run is through portal or programmatically. So, here is my contribution to ADF Community. $resourceGroupName ="Porvide Resource Group Name for Data Factory"
write-host "Total number of slices Failed:$failedSlicesCount"
$Prompt = Read-host "Do you want to Rerun these failed slices? (Y | N)"
write-host "Rerunning slice of Dataset "$($failed.DatasetName)" with StartDateTime "$($failed.Start)" and EndDateTime "$($failed.End)""
Set-AzureRMDataFactorySliceStatus -UpdateType UpstreamInPipeline -Status Waiting -DataFactoryName $($failed.DataFactoryName) -DatasetName $($failed.DatasetName) -ResourceGroupName $resourceGroupName -StartDateTime "$($failed.Start)" -EndDateTime "$($failed.End)"
write-host "There are no Failed slices in the given time period." Microsoft Azure Essential: Azure ML Free book is pretty informative if you wanted to learn about ML. Additionally I recommend to go through free courser from University of Washington available through coursera. Step by Step course of going in depth of Machine Learning. Tried to collate informative articles related to HDInsight. In comments section please add URLs of article / video which you came across and like me to add it to this list. In Introducing Microsoft Azure HDInsight, we cover what big data really means, how you can use it to your advantage in your company or organization, and one of the services you can use to do that quickly—specifically, Microsoft’s HDInsight service. We start with an overview of big data and Hadoop, but we don’t emphasize only concepts in this book—we want you to jump in and get your hands dirty working with HDInsight in a practical way. This white paper describes how business intelligence developers can apply query and processing performance-tuning techniques to their OLAP solutions running on Microsoft SQL Server Analysis Services. This paper is based on the performance guide for 2008 R2 and has been reviewed and updated to validate performance on SQL Server 2012 and SQL Server 2014. To read the white paper, please download the Word document Analysis Services MOLAP Performance Guide for SQL Server 2012 and 2014. 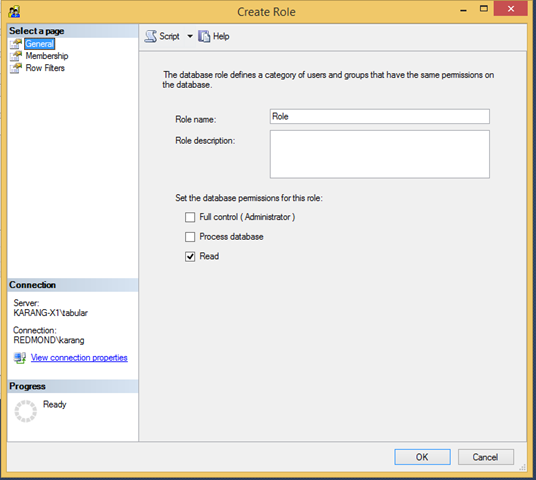 You have a Role which got only Read Permission for Tabular Database with users who can only query Databases which means they can use any client tool and should be able to query Tabular Databases from any tool which they prefer like SSMS, SSRS, PPS, Excel, etc. 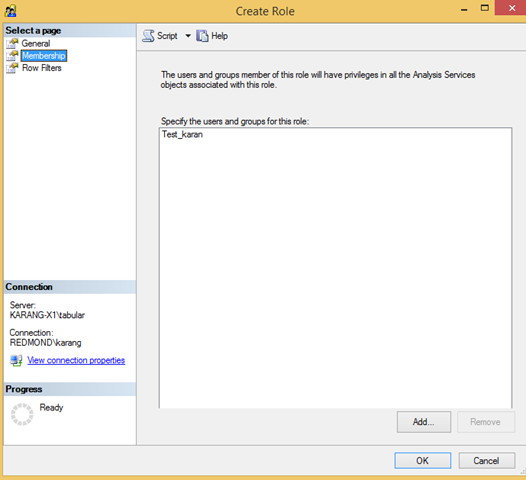 When users from Read Only Role are trying to connect SQL Management Studio they are not able to see Databases on which they have Read Permission but if they do the same thing in an Instance of MOLAP they are able the to see the Databases on left side under Databases tree of Management Studio as shown in Figure 3, if you notice databases are not displayed for Test_Karan user. 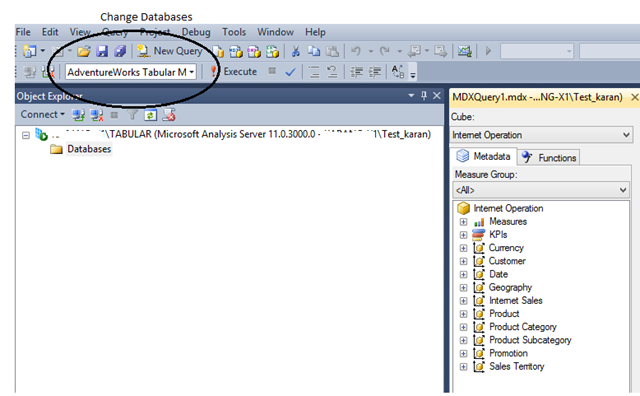 Figure 5: Though you are not able to see all databases but you can change the database which you need to query. In MOLAP when you had Read Permission you were able to see those Databases in Management Studio but in Tabular Instance you cant see any more its by deign, in this post I have tried to show something simple which we generally tend to miss.